Wolky® shoes and sandals are designed with the utmost attention to detail. Considering the endless hours you spend on your feet, a shoe should offer more than just style and grace. It should also be comfortable. Rest assured that quality is the top focus with each and every step of the footwear process. Your feet will start to feel amazing the moment you slip your foot into a Wolky shoe. Quality is always at the forefront from the design concept to final production. Designers put a lot of thought into the entire process before creating a collection. Every loop, lace, ban, seam and eyelet, full-grain leathers, and colors are all carefully considered from the design concept to the shoe making process from start to finish. Fashion is one of the key elements in designing Wolky footwear, but that does not come at the expense of comfort. Their motto "It's what's inside that makes the difference" and not just for fashion. 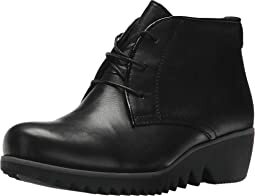 At Wolky, they strive to provide the world’s finest fashion and comfort footwear to ensure that you can put your best foot forward with healthy support and in fashionable style. Usually I wear an 8.5, sometimes a 9 - ordered the 40 and the fit is perfect. 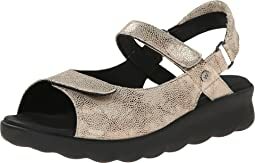 Wolky sandals are very comfortable - I love that you can adjust the straps. Love these shoes!! 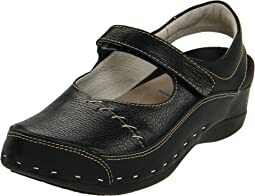 I am considered a "senior citizen" so I want comfortable shoes, but still want some style! These shoes fit that description perfectly!! 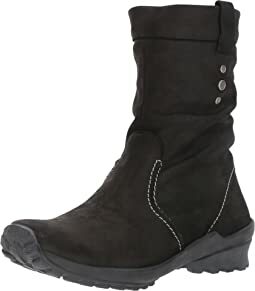 These are great boots very warm, waterproof and practical. I highly recommend. 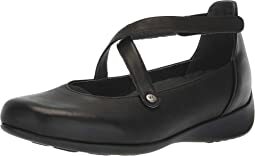 Cute comfortable shoe, nice leather. Unfortunately the upper leather was not wide enough for my wide feet and left too large a gap for comfort so I had to return them. Wonderful comfortable shoes but I had to go a size down. Beautiful leather, I will buy the black pair. very comfortable bootie. I can wear them all day and they still feel good at the end of the day. I love this shoe! I bought a multi blue color years ago, I wore them so much that the insole wore out. I just recently learned I can replace the insole! The shoe is very comfortable, and true to size. I wear a 9 in almost every comfort brand and the 40 fit great. My foot is a little wide but I don’t wear wide size. The Velcro on all the straps makes it easy to fit to your size. This time I ordered the taupe cobra color and it is beautiful! I docked it one star because the dye from the insole colors the bottom of your foot black. This happened on my first pair (bought 5 years ago) and my new pair is the same!. It’s very disappointing when a company ignores an obvious design/material flaw. It does go away after a while. This is my first pair of Wolky. I have bunionettes, hammer toes and am missing 1 posterior tibial tendon - comfort & support is a challenge these really meet. All straps are adjustable w/Velcro. And the metallic beige works with so many neutral colors. I'll be ordering more of these!! Felt comfortable, unfortunately a bit too big and has to be returned. Also seemed to come up high - the edge of the shoe was hitting my ankle bones. I would imagine after a day of walking it would become rather painful. Beautiful quality leather shoe. I’m 5/12, in all shoes. but I a needed a 37. In this style. Very comfortable, these are a keepers. Fit and size were just right. I really love the leather uppers, which have a small area of perforations to cool the feet. The color and style are super! The shoes looked wide in the the toe box but were actually tight in the big toe. 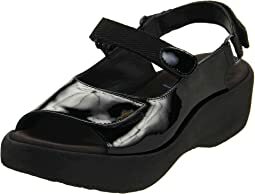 I loved the style and have many other pairs of Wolky shoes and sandals. These did not fit well. I'm a small size 5, it fit perfectly. No rubbing from the first time on...gives a bit of height and is really comfortable. People have stopped me and asked where I got them! 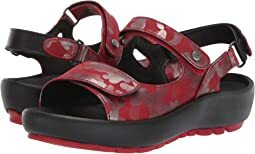 Nice for walking, I was looking for a nice, non-rubber flip flop sandal..this is it! I couldn’t wait to get these sneakers, having worn Wolky before I was expecting a supportive fit, however these have very little to no support, hard, rigid bottoms - not flexibleat all and they ran large and wide. Loved the patina pewter color, cute style but the fit was so off. So disappointed and sad to have to return them :( but nothing about Wolky Katla was comfortable. Thanks Zappos for your generous return policy. When I first took them out of the box I wasn’t quite sure if I liked how they looked. After trying them on I fell in love with the fit and how comfortable they are. They look much better on then in the box so....go try them on!! Well....IF my Big Toe wasn't rubbing against the edge of leather: These WOULD have been GREAT!! WONDERFUL SOFT leather (except the edge with stitching) .I did not want to take the chance In case the leather did NOT get softer. I do have a large & wide big toe. (MIGHT be FINE for everyone else). Then I remembered trying on a few other styles of Wolky Sandals last Summer when my Big Toe was NOT happy. 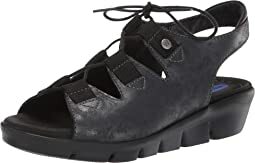 It might have been a different material OR the velcro TOGETHER with material that bothered me on a DIFFERENT Wolky sandal. 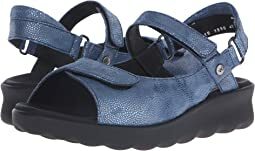 I am waiting to get my size in a different Wolky sandal with Adjustable straps! I love this shoe! I originally ordered it in a 40 as I have other Wolkys in a 40 and they are perfect. This one was comfortable but the 40 was just a tiny bit too small - I could feel my toes against the top. The 41 fit better. These shoes look great with jeans, crops and even shorts. They would be fine with certain skirts or dresses too. They look cute with socks but are comfortable without socks too. They are very padded/cushioned along the bottom. I've had other Wolkys, but this one was too narrow. Love these shoes, super comfortable and great fit, just what I expected from Wolky. 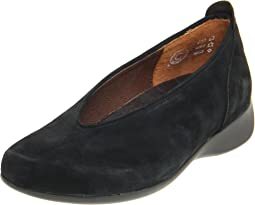 Really cute, comfy, cleverly made shoes. I have worn Wolky for 20 or so years. They last forever. I like this heel as it seems a little lower. No squishing when I walk. Fit fine. But I love the croc red the most! Sassy Lassie Smart. I was hoping these shoes were more of a peep toe rather than fully open in the front, but they weren't - so reluctantly I returned them. However, they are really comfortable. 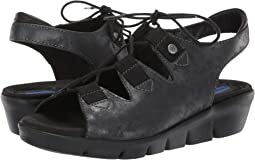 I think they would be great for someone looking for a sandal with a lot of support. The footbed on these is fantastic. Super supportive and comfy. I have some issues with my feet and toes, including bunions, and I wish the toe box was just a little bigger. I wear the largest size these come in, so I don't have the option to order up. The shoes look unconventional, but good. They seem well made. I have ordered sizes 40 and 41 of Wolky shoes. I've been able to wear both sizes, more or less. I find the 41 a bit too long, and the 40 a smidgen too short. For the Pichu I ordered the 40. My big toe comes over the front edge a bit, but the arch is in the right place. 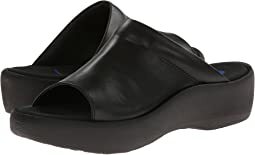 I need an arch support, as well as a stable foot bed (one that doesn't bend too much due to metatarsal arthritis). This sandal worked for me. There is a bit of rub on the big toe from the top strap, hopefully that edge can be softened up a bit. Anyway, overall I'm pretty happy with the purchase, so much so that I put the boxes in the recycle bin right away.